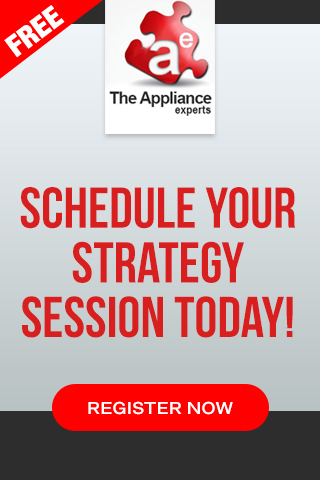 Today we are going to discuss some of the strategies and sources of leads that you will want to focus on in 2019 to keep you and your appliance repair technicians busy. 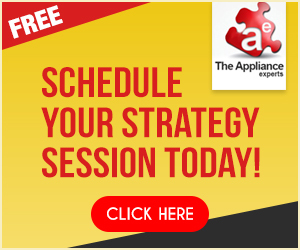 Your goals for 2019 – primarily how many appliance repair leads do you want to get to hit your revenue targets at the end of the year? The beginning of the year is a great time to figure this out, so you can develop some type of roadmap to get you from where you are to where you want to be. 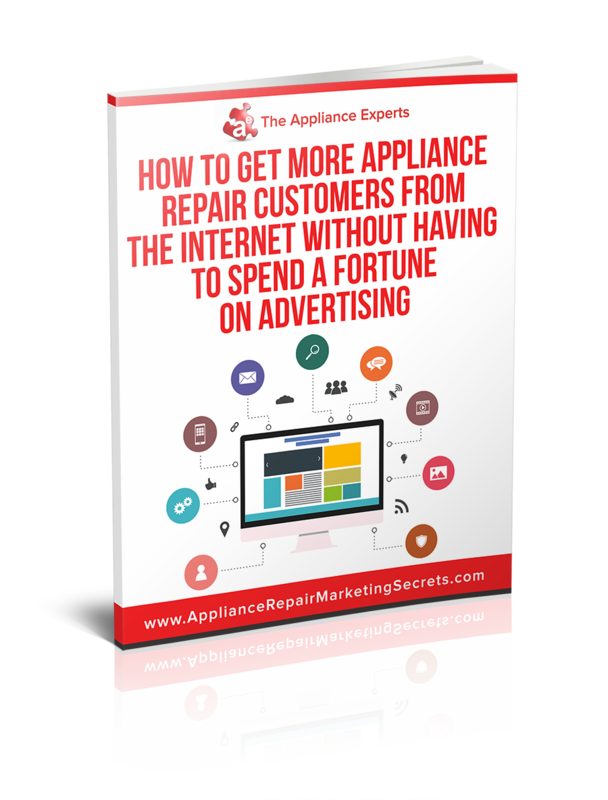 3 fundamentals of appliance repair marketing success – message, market and media that appliance repair companies should be using. How to optimize your website for conversion in 2019 and beyond – you spent a lot of money or time on your appliance repair website, but if it’s not set up for conversion then you could be losing customers and not even know it. 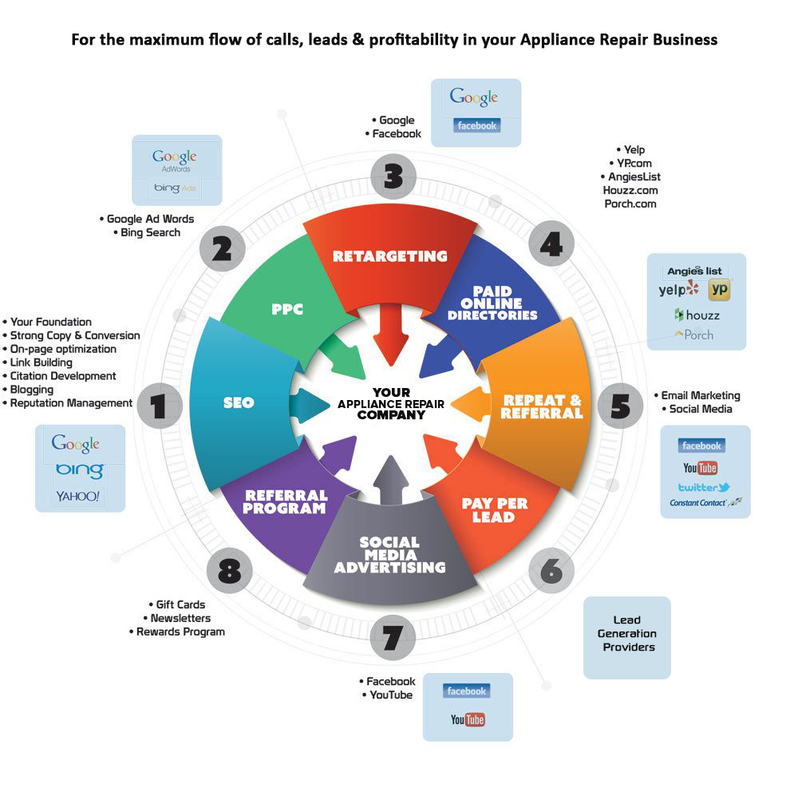 The “BIG” picture of all the online marketing channels – you should be tapping into these channels if you want to maximize your appliance repair lead flow online. The latest appliance repair marketing trends – we will discuss which trends you should focus on in 2019. How to develop a custom action plan – based on where you are right now and what you need to do to take your appliance service business to the next level. How much money do you want to make by the end of the year? What is your revenue target? How much is that on a monthly basis? To answer these questions, you decide how much you want to make by the end of the year, then break that down on a monthly basis. From there we need to figure out the amount of appliance repair leads that you are going to need per month to reach that target. Now you will need to figure out what your average completed appliance repair job is worth. This number will be specific to your appliance service company, however, most appliance repair business owners that I ask this question, usually say somewhere between $150 and $250. The next thing you want to figure out is what the lifetime value of your customers is. And what I mean by that is, appliance repair customers should not just be a one-time customer? Instead each customer should become a repeat customer, because they were so happy with the appliance repair service you provided, that not only will they call you again when another one of their appliances break down, but they will also be more than happy to refer your appliance repair business to all their friends and family. Based on the number of appliances, friends and family the average person has, the lifetime value of an appliance repair company should be somewhere around $1000. So how can an appliance repair business improve the lifetime value of their customers and get more repeat business? Staying top of mind is key! If you service their appliance in January, and they have a friend that needs an appliance fixed in August of this year, they may or may not remember you, right? Regularly following up with the customers and staying in touch with them, is a great way to remind them that you are the best choice for appliance repairs. But what can you do to stay in front of your customers? Appliance magnets are one great thing that you can start giving out to your new and existing customers. For existing customers I would recommend mailing them one, and for new customers going forward you can put the magnet on their refrigerator or any of their appliances and that way your appliance repair business will continuously be in front of them. Calendars are another great thing that consumers love to get at the end or beginning of the year, that they can put up on the wall or on the fridge. A lot of real estate agents do this strategy with making use of calendars and magnets. It’s a great offline marketing strategy to adopt into your appliance service business and it’s a low investment that is well worth it. These are just 2 examples of things you can implement this year to start to improve your life time customer value and repeat business. How many technicians will you need to hit your goal? If you are a one-man operation, it’s not unusual for a company that size, to earn $100,000 in revenue per year. Now, that’s assuming a one-man operation can get the appliance repair leads that he needs, which is typically the challenge. But with doing 4 to 5 jobs a day, a one-man shop can easily make $100,000 a year. Let’s assume you are not a one man show and your goal is higher, maybe you want to earn $300,000, $500,000 or more this year, then you’re going to need some help, if you don’t already have additional appliance service techs in place. I’m going to assume that you want to hit $100,000 by the end of the year. Breaking that down on a monthly basis, that’s about $8,300 per month. The average appliance repair job value that I’m going to use for this example is $150. How many calls will that require to hit $8,300 per month? It’s 56 phone calls per month. How did I come up with the amount of calls needed? I divided the monthly revenue target of $8,300 by the average transaction value of $150. And then how many technicians are you going to need? That depends on a lot of factors, so I am not going to include that here, but you can easily figure that part out. How many appliance repair leads will you need? We all know that not every consumer that calls are going to turn into a scheduled appliance service job, so now we need to estimate how many calls or leads do we need to get, to end up with enough scheduled jobs to stay on track. In the example above, we need to get 56 scheduled per month, and we know in order to get 56 completed jobs we are going to need more than 56 leads per month. So, to figure this out, we now need to figure out what is the average conversion rate from phone call to booked job. Some of you reading this, may already have an idea what your phone conversion rate is, maybe 50%? Ideally,the phone conversion rate that you should be aiming for is 80% to 90%. And there’s several variables that will affect this, such as your availability or how proficient is the person answering the phone. From the statistics that we acquire from our pay per call appliance repair lead generation program, some of the appliance repair companies we work with start out with a 50% phone conversion rate, but with the help of call tracking platform and providing them with feedback on how to improve their conversion rate, we can normally get them up to a 80-90% conversion rate in just a few weeks. Once you figure out your phone conversion rate, you will now want to multiply that number by the call target. And I’m going with an average conversion rate here of 55%, so that’s 55% of all the calls or leads that come in will actually turn into a booked job. I’m going to take the 56 calls multiplied by 100% and divided by our conversion rate of 55%, equals 101.81, but that’s going to tell me that I need at least 102 appliance repair leads per month to hit that target. So, 102 phone calls or leads per month are all what we’re going to need to get 56 book jobs per month. All right, so hopefully you have those calculations down, if not take a few minutes now to figure out these numbers before continuing. Message – This is what you are communicating to consumers about your appliance repair company in your advertising. Market – This is the consumers in your local service area that are in need of appliance repairs. 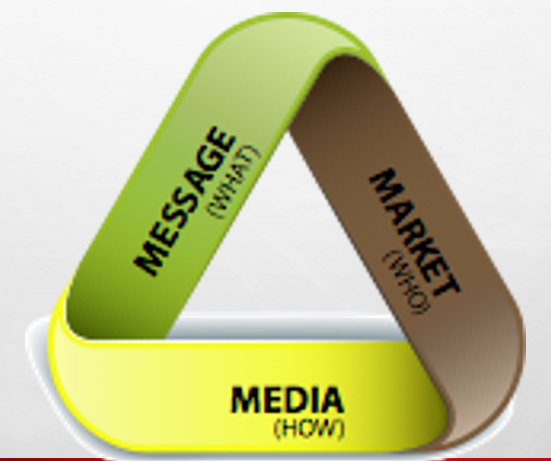 Media – Is the sources of advertising that you use to get your message out to your target market. If you were to take a look at all the customers that you fixed their appliances in 2018 and if you were to find all the similarities amongst all of them, you would start to notice that there are certain commonalities that stand out. You may or may not be aware of it, but there are certain characteristics that stand out from your existing customers. For some appliance repair companies, they may get more female than male or vice versa. For others they may get more single parents versus married couples or vice versa. There are certain things that will stand out about your existing customers. If you really look into, and if you can identify these common things among your customers, you can then create a better advertising message to better communicate with them and to better attract more customers just like them. This is the exercise that will help you to identify who your ideal customer is. Can’t get the appliance repair company on the phone or to return that phone call. Need to get their appliance fixed today, not tomorrow, not next week. They worry that the longer the appliance takes to get fixed the worst the problem will get, and the repairs may get more expensive. They are afraid of being ripped off or overcharged. Having to wait around all day for the tech, who never showed up or even called to say he couldn’t make it anymore. The repair cost is higher than they can afford. Being aware of the concerns of consumers is huge! Just understanding these concerns will help you to communicate and craft a better advertising message. The reason you want to figure out the fears, frustrations and demographics for the consumer is if you can get into the consumers head and understand how they think, then you can better sell them on your appliance repair services. What is your existing advertising message? Why should a consumer choose your appliance repair company over your competition? Can you list 3 reasons why they should choose your company? You don’t want to be a commodity type of business. And what I mean by that is if you were to go into a supermarket and you wanted to buy milk, how do you choose which bottle of milk to buy? For most consumers, we pretty much just go and grab a gallon of milk. Not a whole lot of research or planning goes into buying a gallon of milk. Maybe you look at the expiry date, right? But you don’t go too much further than that. And let’s assume all of the milk bottles have the same expiration date, then how do you choose? We would just pick the closest one in reach. Milk is a great example of a commodity product and as an appliance repair business you don’t want to be commoditized by consumers, but unfortunately most appliance repair companies are a commodity, because all they do is copy what their competition is doing, so everything looks the same to consumers. Their website looks the same, advertising message looks the same, etc. There needs to be something that stands out about your appliance repair company for consumers to choose your business, instead of your competitors. Same day service – we’re going into a marketplace now where consumers want ONLY same day service. On time guarantee – this is huge! We talked about one of the frustrations for consumers, having to sit around all day and to take time off work with an on-time service guarantee. You will not only address this concern, but you will definitely stand out from your competition. Guarantees – Consumers want to know that you’re going to stand behind your work and if the problem wasn’t fixed the first time, you will send the technician to fix it, without any additional charges. Experienced Technicians – they want an appliance service technician that knows what he is doing and has fixed similar appliance repair problems before. Coupons – Everybody loves to save money. Some business owners think that coupons cost them money, because they make less on the job, but with the right coupon strategy, coupons can actually do the opposite and make your appliance service business more money! Media is how you are going to get your marketing message out to consumers in your local market about your appliance service company. We are going to start with discussing your website, since a lot of your advertising sources will send the consumer back to your appliance repair website, to find out more information about your company. Your website is a hub. This is why your appliance service website needs to have important conversion elements. 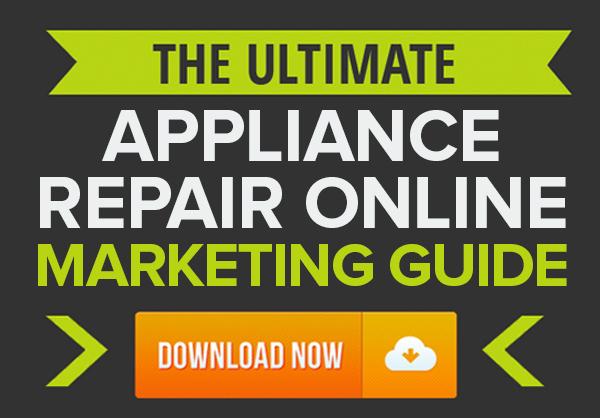 Is your appliance repair website set up to convert consumers into callers? One of the best conversion elements you could have on your website is your phone number in the upper right-hand corner of your website, because that’s what consumers are looking for. There are many studies on this, that found out that when consumers look at website pages, their eyes gravitate to the upper right corner. Check out the image below for other conversion elements that can boost your website conversion rate and turn more of the consumers that visit your website into callers and leads. Mobile searches have now exceeded desktop searches online in 2018 and it’s just going to continue this year. More and more people are just using their phones for everything nowadays, instead of their laptop or desktop computers. Google changed their search engine index in 2018 from a desktop index to a mobile index. What that means is they used to focus more on desktop computers, since that’s what most people used until recent years, and they optimized their search engine based on desktop computers. In 2018 they made the shift because they saw how mobile searches are becoming more popular and now their index on their search engine is optimized for Mobile. Without a mobile friendly website, you’re losing customers! If you started to see less customers in 2018 from your appliance repair marketing and you weren’t sure why, it could be because your website is not mobile friendly. If you are not sure whether or not your appliance repair website is mobile friendly, there are 2 ways that you can check. You can manually do it by going to your website on your phone and it’s a good idea to look at your website on both an iPhone as well as on an android phone. The different phone operating systems can cause it to display differently. Make sure that your website is easy to use on both types of phones. The 2nd option is to see what Google itself thinks about your website and you can do a free Google mobile friendly test. Once you are at the mobile test website, all you have to do is enter your website address. In a few seconds, they’ll tell you whether or not your website is mobile friendly and any suggestion they have that could improve your website. Even if you know that your website is mobile friendly, it’s still a good idea to see what Google thinks. It’s free and only takes a few seconds. How do you know if your advertising is working or not? One of the best ways to do this is to put a tracking in place. Call tracking is a great and inexpensive way to figure out if your advertising sources are working or just eating up your adverting budget. If you have several different sources of advertising that are bringing you leads, it’s important to know where your leads are coming from, which source of leads are actually turning into booked jobs, as some advertising sources you could just be paying for clicks or impressions which never result into appliance repair leads. Setting up simple dashboards to measure your key performance indicators is a great way to figure out if you’re on track. Get clear on the messages that you’re going to use to communicate to the customers and why they should choose your company. Get clear on what media or source of advertising you’re going to use. Make sure your website is mobile friendly and optimized for conversion. And you want to set up simple key performance indicator tracking so you can see what your return on investment is, so you can see what your true cost per lead is from the different advertising sources. Then you can decide what is really working. The online dominance blueprint is an outline of what we believe you will need if you want to dominate your local service area. Most of the sections are self explanatory but there are a few that we want to focus on because we either see it done wrong all the time or we just want to share our opinions. 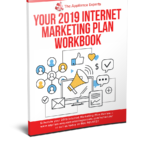 The more things that you can implement in your business from this blueprint, the better position you will be in and dominate your local service area. Email marketing and social media. Being active on social media is a great way to stay in front of your existing customers so that you get more repeat business and referrals from them. When you do your daily posts, it shouldn’t be all salesy. That’s one of the biggest mistakes I see with appliance repair companies, where every post is a sales type ad, same day service, 50% off, etc. Instead, you want to make your sales post every now and then, so if you do 5 posts in a day only one should be about sales, the rest should be either inspirational quotes, fun factors, educational posts about maintaining appliances etc. Social media is not like Google where consumers come to find a solution to their problem. Instead social media is more like advertising on a billboard. Consumers go on social media to hang out with their friends and family and see what the latest updates are in regard to their friends and family, not to buy things. So, if most of your messages are salesy with your social media marketing, you’re not going to get a whole lot of interaction there. Let’s use Facebook as an example, if your customers don’t interact with your posts then Facebook will stop showing your posts on their timeline. That’s why fun facts, inspirational quotes and educational posts are great, because it will encourage them to like or share your posts, which communicates to Facebook that your customers want to see every post that you make. Appliance repair job leads providers should supplement your existing advertising and marketing, what do I mean by that? Just like we are supposed to get majority of our vitamins and minerals from the foods we eat, that is not always case, because of our busy lifestyles and the food nowadays just don’t have the number of vitamins and minerals as they used to. That’s why we need a multi-vitamin or individual vitamin supplements to fill the gap. Appliance repair lead generation services are like those vitamins. While not necessary they can be an important component to an appliance repair business to help provide consistent appliance repair leads month after month. 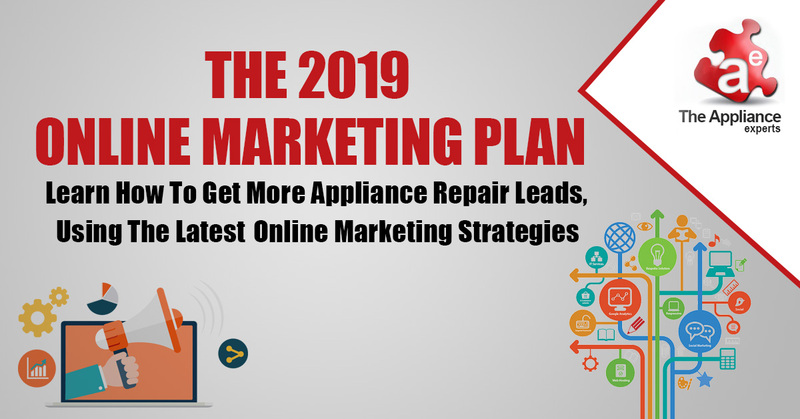 Now, if you’re a one-man operation, then appliance repair lead generation is more important to you, because you either don’t have a customer base yet or it’s rather small. Working with a lead generation company that can provide you with quality appliance repair leads can help you fast track your business goals, especially if you focus on pay per call leads from a company that works exclusively with you. They can provide you with as much leads as you can handle and you can grow with them. So as you hire technicians, they can provide you with more leads to keep those techs busy. Some consumers will love to refer their friends and family to you, as it brings them a sense of personal satisfaction to be able to help their family and friends out, but then there are other consumers that need to be motivated and unfortunately most consumers fall into this category. That means you should incentivize your existing customers to refer to friends and family. If you just leave it up to them, you probably won’t get any or will only get very few referrals. I know what some of you are thinking, great I now have to spend more money. I will be the first to tell you it’s a worthwhile investment and remember you only pay if the person they refer schedules the job and you can get a referral in exchange for a $5 gift card. If I told you I would sell you appliance repair leads for $5, you would probably buy them all day long, even if they didn’t schedule. Something else you should consider for your existing customer base is a rewards program, where you give them some type of discount if they call back for another appliance. The Key Appliance Repair Marketing Trends For 2019. One of the things that picked up steam in the middle of 2018 was Google Local Service Ads. Some of you may or may not have heard of it and some of you may have already started using it and testing it. 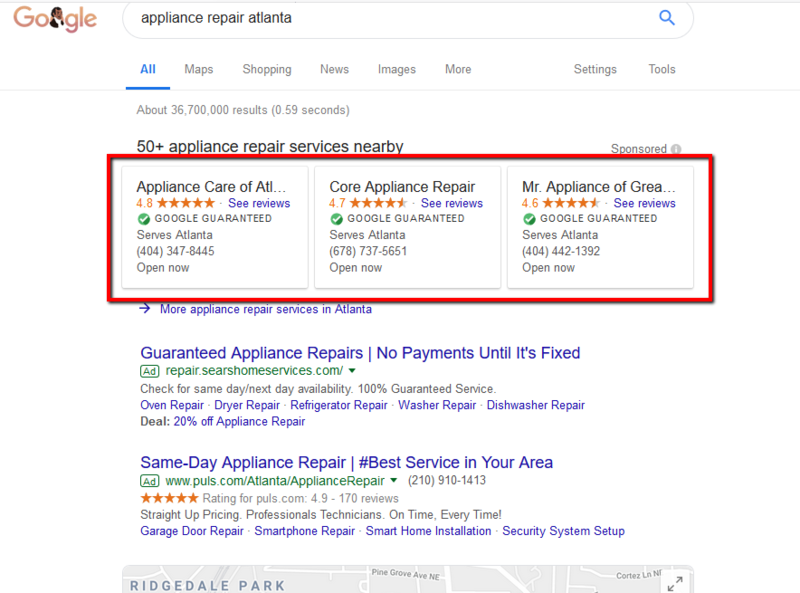 Google is rapidly expanding this appliance repair lead generation program into new cities, so use of this service by appliance repair companies is going to pick up a lot more for 2019. If you’re not familiar with Google Local Service Ads, it’s Google’s Pay Per Lead Advertising Program. You may be familiar with Google AdWords, their Pay Per Click program. With Google Local services, you’re paying per lead instead of per click like with AdWords. You definitely want to make use of call extensions with AdWords and Bing Ads. This will help you to convert more of those clicks into phone calls. After all, isn’t it that you want these consumers to call you? Why send consumers to your website if they don’t necessarily want to see your website? Some consumers that click on your ad are only going to your website to find the number, as they don’t have any other option. With the call extension, you eliminate that extra step for them and it’s a win win situation for you and consumers. Call only ads are part of the regular AdWords platform. With the large increase of mobile searches, Google developed a certain type of ad that only shows up on Mobile devices, which is known as call only ads. These actually have been around for a couple of years now, but it’s not that popular yet. But with the use of mobile phones we expect them to dominate in 2019. It’s definitely worth mentioning and if you’re not currently using call only ads, it’s one of those things that I highly recommend testing. Google Maps has shifted from a centroid focused algorithm to proximity focused. Google Maps Optimization in the past, would require that you have an address in the main city of your service area or the main city of the county. And if you get this verified address ranking number one for the main city, then that same Google map listing or Google My Business Listing would have shown across the entire county as long as that’s within your service area. But fast forwarding into the mobile marketplace, Google realized that wasn’t the best way to show consumers the appliance repair company that was closest to them. So they modified their algorithm to now display results based on proximity to the consumer’s location. And they’re basically using the GPS location data to determine the consumer’s location. You may have seen a drop in your appliance repair leads if you used to get a lot of leads from Google maps in the past. And you started to see a drop last year, due to the proximity algorithm, even if your listing’s rankings haven’t changed, because Google is not showing it as much as they used to in the past. Shift from phone conversion to message conversion. There are a lot of consumers who are now using messaging to contact an appliance repair company instead of actually calling. If you look at your Google My Business listing, you will notice it has section that allows the customer to send a message. You can enable this messaging feature in your Google My Business dashboard, but even if you haven’t enabled it, the consumer still has the option to message, which will come to you in an email. Google again is trying to stay ahead of the mobile marketplace trend and they know that especially millennial’s prefer to use a message feature instead of calling. This is also why it’s a good idea to have a web form on your website, so consumers can have an option to submit a message instead of calling. Having a live chat feature on your website, will also help to convert more consumers that come to your website, because for some consumers doing a live chat or sending a message is a lot more convenient to them. If you have the staff in place to be able to handle live chat, I highly recommend you give it test. Search Engine Optimization – SEO is more of a long-term strategy and it takes few months to get going, but once those leads start coming in, it’s not uncommon for SEO to be the preferred source of leads for appliance repair business owners. Pay Per Click Advertising – whether you may be doing PPC with Google, but not Bing Ads, now maybe the time to start testing that. Lead Generation – If you haven’t worked with any appliance repair lead generation companies, you may also want to start exploring that. Even if you have had a bad experience with lead generation companies in the past, such as HomeAdvisor or Appliance Appointment. All lead generation companies are not created equal, look for one that ONLY works with one appliance repair company in your service area, which means your service area will be an exclusive territory for you. While these appliance repair leads may cost more, they will provide you with a higher return on investment. Social Media – we all like referrals or word of mouth business. Social media is the new word of month marketing and it’s a great way to stay in front of your existing customers to remind them that you are the best appliance repair business in town. Start thinking about working with multiple marketing channels as we go into 2019 and beyond. The image above is a preview of what Google Local Service Ads look like, just in case you haven’t seen them before. It’s currently not available in all markets as of right now, but it will be. The Local Service Ads are the top 3 ads. Notice that they show up above the regular Google AdWords ads. You are going to pay more for these ads or leads, than with AdWords, because they are in a prime real estate location. But if these leads work out for you, they could give you a higher return on investment than AdWords. With appliance repair leads, you get what you pay for. The less you spend to buy your appliance repair leads, you typically will get a lower quality lead. If you’re looking to pay more, you will get a higher quality lead. While you pay per lead, you will still pay for leads that do not schedule. They require a background check. They have tracking in place, so you can see what your Return on investment is. You do need to update your platform on a regular basis if you decide to give it a try, as not doing this could affect the rankings of your ads. Use it as long as you’re getting a good return on investment.Give it a fair try, get at least 20 leads before deciding whether or not it’s a good fit. This is the “NEXT BIG THING” with SEO for 2019 and beyond, again all thanks to consumers using their mobile phone as their preferred way to access the internet. By the end of 2018 “appliance repair near me” has become the second most popular search term for most cities in the U.S. All right, and there’s basically a near me word for all the different repair types. If your competition don’t know about these near me keywords yet, which most of them don’t, you can take advantage of your new-found knowledge and start targeting these near me keywords to get more appliance repair leads. If you would like to have our team take a look at your current online marketing Strategy and let you know where may be room for improvement and discuss the possibility of working together to make 2019 your best year ever in the appliance service industry and finally get your appliance repair lead generation right. Then schedule your FREE online marketing evaluation now.